This is where planes go when they die. 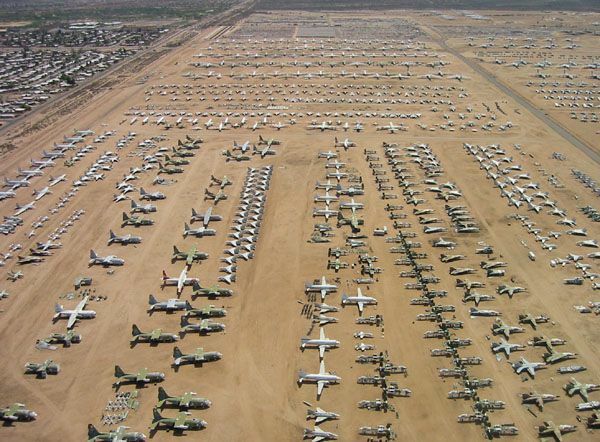 Vast hulks of metal that cost millions to build, now grounded in obsolescence, taken out to the boneyard to be shot in the head like Old Yeller. Their long neat lines look a lot like the white tombs of fallen soldiers at Arlington cemetery, seemingly endless in number, waiting for the day they will be hacked open like sheet-metal pinatas to get at the valuable guts within. Fallen soldiers at a final roll call in the boneyard. 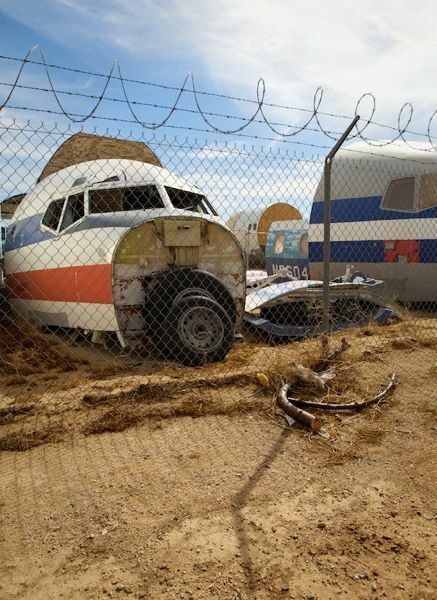 The boneyard is just one part of the Mojave Air and Space Port, the same facility from which Richard Branson’s Space Ship One was launched into space. 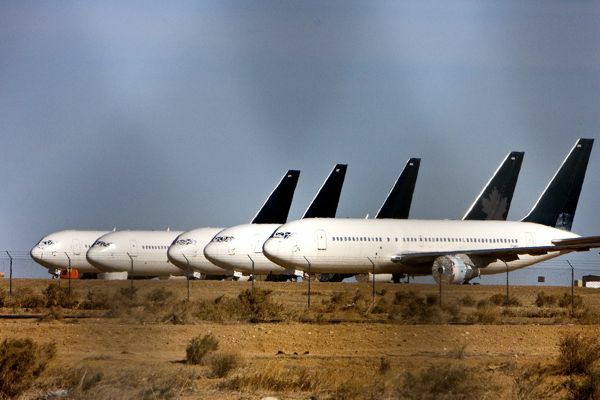 The boneyard is simply rental space provided for airlines that no longer have an immediate need for their planes. It’s a giant storage bay, though one not all planes return from- some sit there for years in the baking heat, slowly roasting like foil-wrapped potatoes. Some planes are used as fodder and a source of spare parts, engineers dipping in and out of their empty hulls to prize free delicate avionics equipment, engine parts, even whole rotundas of fuselage. Some meet their fate at the hands of giant machines which tear them to bits to expose their cabling, ducting, and inner wall electronics for cannibalization. This post is in large part fuelled by an excellent article by Ransom Riggs of mentalfloss. All the HDR photos of the boneyard interior belong to him. In his article he describes first spotting the planes lined up in the desert, their insignia painted over, their doors and engines coated over with white plaster masks, and wondering he was looking at a mirage. After 9/11 the whole facility was clamped down though, and access seemed impossible. After years of inquiries and hoping though he finally met a guy who worked in the airport, and took him inside the boneyard for a tour. Wrapped in gauze and ready for the pyre. Only tyres for a nose-cone, beyond the veil. 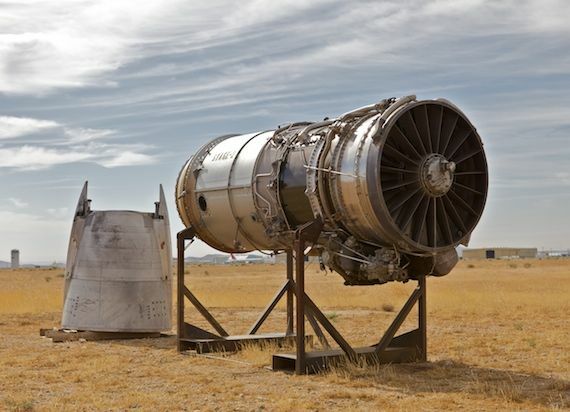 Jet engine without a jet. Tail suspended on rail spars. The process of putting these planes out to pasture is called ‘mothballing’, and is not simply a matter of pulling up to a vacant lot and turning off the engine. ‘Planes that are to be mothballed, if only temporarily, go through a meticulous process to prepare them for exposure to the desert environment. On arrival, the planes are inspected. Fuel tanks are filled with heavy oil, which provides a protective coating for engine parts. Canopies, engine intakes and other openings are sealed with layers of “Spraylat,” a latex-based, permanently flexible substance that is easy to remove. The gutting yard, from Scott Haefner. Like a game of Axis and Allies. The top layer of ‘Spraylat,’ which is white, reflects enough solar heat to keep a plane’s interior at nearly the same temperature as the outside air. Without Spraylat, the interior could quickly heat up to 200 degrees Fahrenheit during hot summer days. The coatings protect the plane’s most vulnerable parts against sun, wind, dust and nesting animals. Every four years, the planes are brought into an open hangar for a checkup. 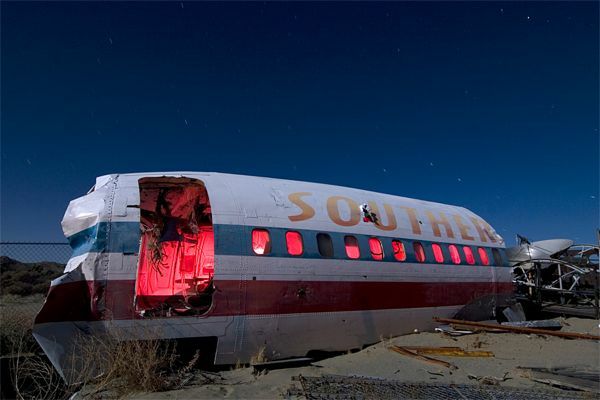 Distinctive Troy Paiva night shot of a smashed fuselage (prepped for a movie). Super slow night shot by Joe Reifer. Tip-off credit for this post goes to David Meyer, who sent a link to an article about a Pan-Am fan who goes to the Mojave boneyard looking for vintage Pan-Am parts to outfit his replica Golden Years Pan-Am cabin in his garage. That was on the post about the South Korean couple who spent all their cash buying the world’s first commercial 747 to use as a restaurant. Cheers David! See a curation of curious world ruins here. Read my stories inspired by ruin here. If you like what you’ve read here- why not subscribe to the email newsletter for free updates. Many of the planes do return to service. The location is ideal due to the dry desert air which helps to preserve the planes. Many of them are scrapped but many are there temporarily and then returned to service. I have driven by there in years past and have seen these huge jets parked out in the middle of the desert. It is a very strange thing to see. Actually, almost none of these planes are ever used again. Most are decades old in design and had reached the end of service life. Wow replying to a 5 year old comment. Interesting. Hadn’t been to your site for a while and as I’ve been out to the Pima Air and Space Museum a couple time, which right next to Davis Montham, I thought I’d throw my two cents in. I find it odd, really, that any of the old military or civilian aircraft spend more than a couple years there without being scrapped. To my knowledge, the only aircraft out there that have been brought back into service were the A10 Wart Hogs and some of the Apache helicopters for use during the first Gulf War and again in our invasion of Iraq. Seriously, what’s the point of keeping old DC 8s or even older 737s intact? No one, to my knowledge, even flies the former and the latter has gone through several design changes including fly-by-wire control in the last version. 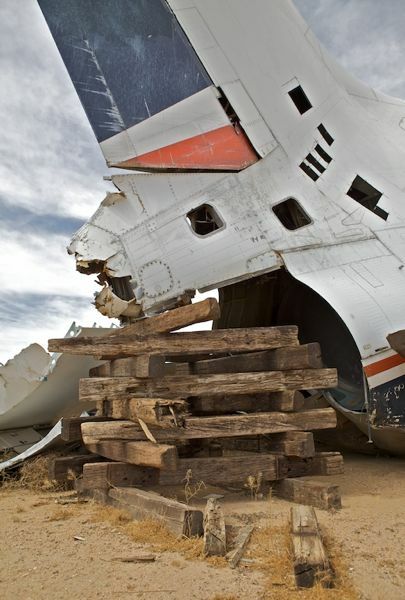 Nice article, never thot planes will be left to rot/preserved in the desert. Any chance Hollywood using these boneyards for their post-apocalypse themed movies ? I was wondering how easy it is to gain access to do a photo shoot in the graveyard. I am very interested in shooting against some of the really old planes, the ones that are there for good. Any one know who I could contact to see if I can make this happen. I think post 9/11 it will be very hard to go in for a photo shoot. Whilst searching google for this scrapyard I have come across a lot of comments of people that have tried to arrange a shoot and been flatly refused. That’s not to say don’t try. Just keep in mind it may not happen. I would love to see a proper shoot of this graveyard though! Just wondered if anyone knows the distance from Vegas to this site. My husband would love to see it and we will be Vegas this year and would like to drive out if possible.Would appreciate helpful comments! Thanks! Coming from LV to Mojave is as simple as you can get. Take the 15 south to Barstow, get on the hwy 58 off ramp before you get to Barstow. Stay on the 58 to Mojave. you’ll run right by the airfield. have a nice trip. how would one go about buying old cabin overhead compartments? I would like to know if you have the contact address or phone information of the Boneyard? I would like to know what do i need to do a fashion photoshoot there? Is that phone number still current? I tried calling it and got a weird answering machine. I really wanted to see if there was anyway of getting a tour of the place, it looks extremely interesting. If there is a number I could call to schedule something that would be great. Thanks! I wish to locally manufacture ‘System Trainers’ for my students pursuing A&P programme in our private college. In view of that I need scrapped aircraft parts for this specific purpose.. Is there any way I could get that from here. Would appreciate if someone could assist me. Sad to such great planes being cut up for scrap,but….. Everything has its time in history. But, there are many orgiazation that save them for others coming along to see and enjoy them. Wonder what they will be flying in? This place is pretty cool. My dad drove me around there when I was really little. He worked on the Air Force Base. Its goverment property, so thats why you can’t get in. I know the Air and Space Museum has tours in Tucson but I dont even think they allow you to get off the bus. Very interesting. Never knew that even planes had to lay themselves in the graveyard. Great pictures. My son who fantasizes aeroplanes would definitely love to see this. Will make a trip to Boneyard soon. Wow! Its a never heard story for me. I used to wonder about planes where they go after retirement any junkyard or what? But now I have full sense of that just because you. 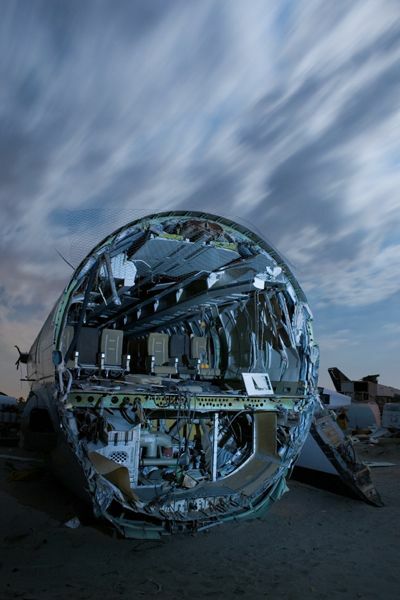 Awesome pics and after reading the story I really want to have a trip of this boneyard. Is that possible to go inside in the boneyard or have to take some special permit or something? And it’s not the only one – just the largest. This is a great article. I would love to go there and try have a look around, probably fenced off I presume! 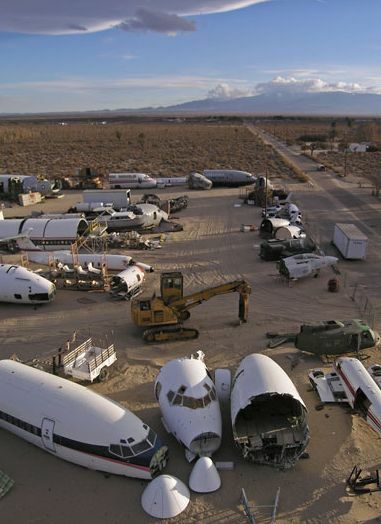 Fortunately i have seen Aircraft warehouse in Southern California, it is an amazing place.Now want to visit this boneyard next.Good post , specially pictures you shown. 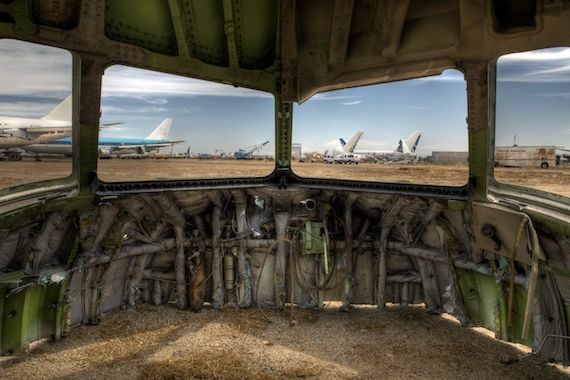 Wonderful post.What will be the great view at this boneyard.When i would be there? I can’t imagine – 200 degrees Fahrenheit temperature,Spraylat is a useful plastic compound to control heat. Does it have an address? How would i get there from Los Angeles? Very informative . I really never knew that airplanes were also dumped at some point. My son would really love to see this place as is very interested in aviation related stuff. As mentioned by Alexa even I never thought airplanes were dumped at some point. It is useful informative that is given here. I will try to make to this place this weekend. Thanks for the information provided. Very well written article. I would love to visit this place. I have seen airplanes fly high in the skies but to see them dumped is something different. My kids would love this place. Thanks for sharing this information because I never knew about this before. The location is ideal due to the dry desert air which helps to preserve the planes. Nice article. I want to visit this place. What will be the great view at this boneyard.When i would be there..I think its really awesome. Thanks for sharing this information because I never knew about this before and i want to know more about it. I’m driving from Bay area to Vegas next week and would love to stop by to take a look. I understand this place is clamped down, however, do you still get a great view from a distance? Can folks share their experience? Hi, can i buy a original parts of my PT-17 Stearman?. I have never heard about such a place. I loved the picture posted here. I have seen aeroplanes that fly proudly in the sky. Now I see that they too are dumped. I must surely visit this place. I am really glad I found about this place. I am highly impressed and amused looking at the vast campus of Mojave Air and Space Fort.The Mojave airport is also known as a storage location for commercial airliners, due to the vast area and dry desert conditions.I appreciate your symbolism ‘fallen soldiers at the final roll call’ to those aircrafts who have reached to the end of their life and are ready to get scraped.I have bookmarked this page already and will share the link on my social network.Mojave airplane boneyard is now on the top of my list of places I want to tour. My son is a great fan of aeroplanes. He loves them and dreams of becoming a pilot one day. But he is of the opinion that they are always proudly flying high in the sky. I think once I show him this place, he will understand that a machine is a machine and cannot go on and on. I once read about this place in a book. But I wasn’t very sure how to reach the place. I was looking for directions and found this wonderful blog. The picture posted here is really awesome. I am waiting to visit this place. Hopefully I will be visiting it in the next weekend. There are two places pictured in this gallery. 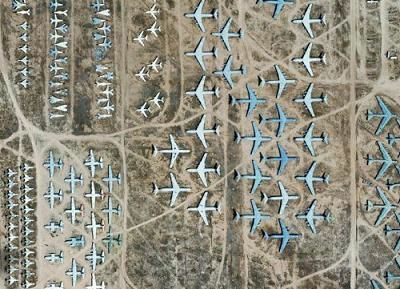 One is the US Air Force ‘boneyard’ at Davis Monthan Air Force Base at Tucson, another is a commercial storage facility at Mojave, north of Los Angeles…. I’d like to buy a Boeing 747 handle bar exit door. Where can I found it? I am an artist and need 25 airplane windows for an art installation that I am doing. Do you have them? Can you view these planes while driving threw the mojave desert? We are driving threw there tomorrow. Cheers. Do some research about the perfectly good airliners that were brought to Mojave for storage after 9/11 caused there to be a huge dip in people flying. These were definitely intended to be used again, and many were as conditions improved. Many were brand new at the time. Nowadays, it seems likely that many stored there due to 9/11 are no longer useful, but certainly many of those types (747s, obviously) are still being used today and would be used if the planes are still in usable and safe condition. When I saw the title of this post I thought I was going to be sad at all that waste of material and expenses. But after I read on and some of the comments I actually found it quite refreshing. I love the thought of drinking from a coke can that was once part of a plane, or seeing a plane wreck on a film that was once actually a real working plane that carried passengers.